U.S. Air Force photo/Airman 1st Class Andrew Moua Airmen go through the serving line at the Almost Mama's Home Cooking potluck on Barksdale Air Force Base June 20. 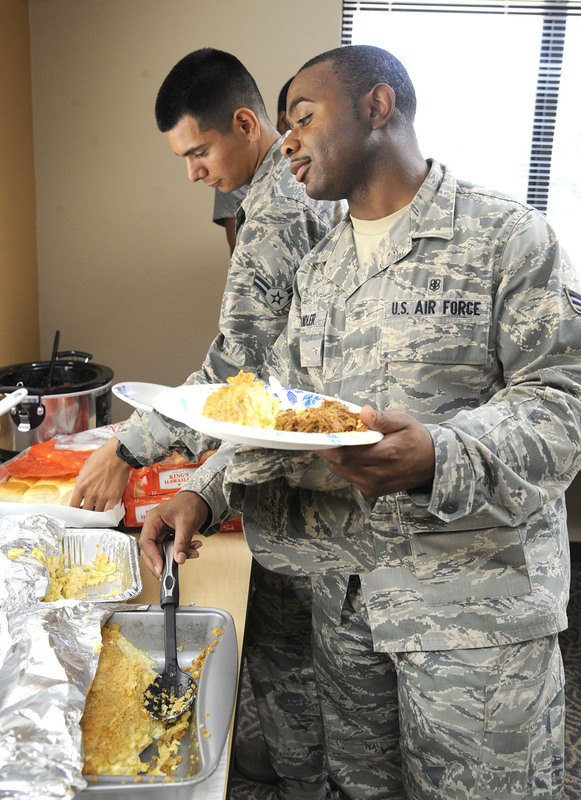 Barksdale?s Top III organized the potluck to show appreciation for Airmen in the dormitories. BARKSDALE AIR FORCE BASE — Airmen got a taste of home cooking at a dinner held at the Stratofortress dormitory June 20. The “Almost… Mama’s Home Cooking” potluck was sponsored by the Barksdale Top III in an effort to bring Airmen together and show their appreciation. Entrees provided included pulled pork, grilled chicken, macaroni and cheese, potato salad, desserts and more. Dormitory Airmen were welcome to bring dishes of their own, but contribution was not required for attendance. With a constantly moving mission, the potluck helps Airmen feel valued. The potluck dinner, which took place right after the dorm council event, was also used to raise awareness of the council. The dorm council allows dorm management staff and Airmen residents to meet and discuss issues regarding dorm facilities and quality of life. The Top III plan to host future potlucks is to inspire the dorm community to take care of each other. Airmen can’t always be with their own families, but thanks to Barksdale’s Top III and dorm management staff, they can be with their military family and have a home-cooked meal.